Home > Blog > Charlotte's Top 5! With Christmas fast approaching, here’s my top 5 favourite Personalised Charity Christmas Cards from our range. Our card calendars are a great way to keep your business’ name in front of your customers year-round. You can personalise the outer card and inside calendar with your company details and contact information. Like the card version you can change the colours of the baubles on this card calendar to match or compliment your brand colours. Once folded this product fits into Royal Mail’s lowest price band and comes with Peel & Seal envelopes. This is one of my favourites from our Laser Cut Card range, cut on a beautiful red pearl board and personalised on a paper insert. With all of our laser cut cards there is the option to change the show through colour behind the laser cut design to a colour, though the inside where your greeting is printed will always be on white. As with all of our designs you can have any additional contact information for you or your business along with a greeting on the inside of the card in black and white for free. 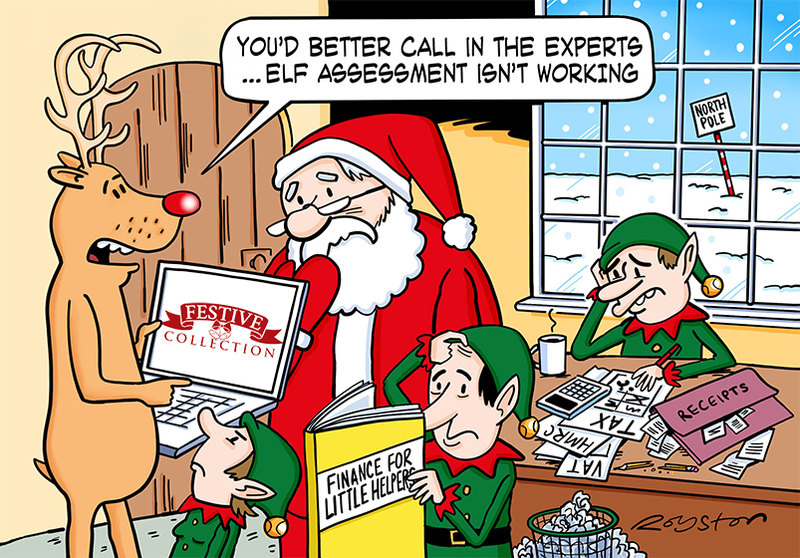 Elf Assessment is a fun and humorous design, featuring cartoon depictions of Santa and some of his elf helpers. This card comes with the option to front personalise the card with your company name and/or logo, as well as inside the card. Colour printing can be added to the inside any of our cards for an extra cost of 20p per card, which can be used to print logos, text or signatures in colour. 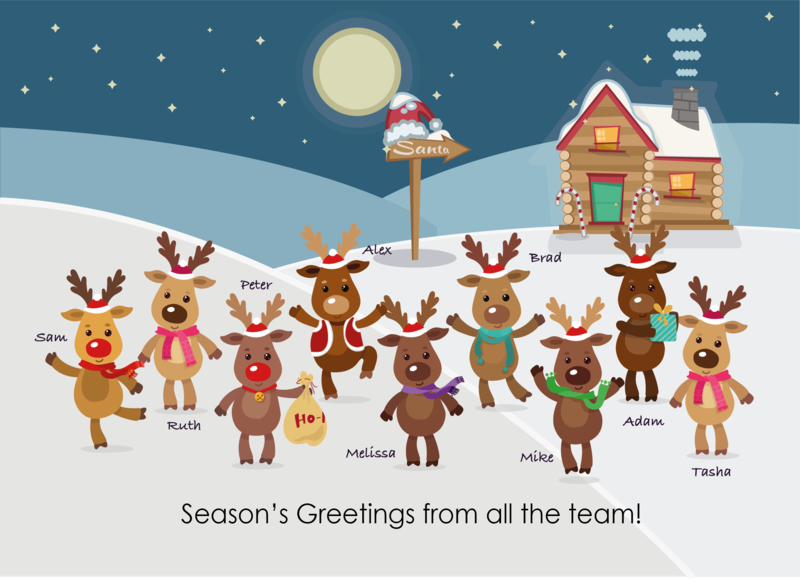 Teamwork Reindeer is a lovely way to spread some festive cheer with your Christmas Card order, turn your team into reindeers with their names and a variety of accessories (hats, scarfs and presents etc) just add any requests to the special instructions box on the web order form! You can also add staff signatures or company logo to the inside of the card, for a one-off payment of £25.00 (ex VAT) which can be used again in future years providing there are no changes! 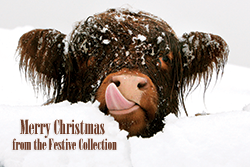 This cute design shows a calf covered in snow. Like many of our designs it comes with the ability to front personalise your order of cards with your company name or logo. All of our designs come with the option to support a charity with your order. We donate 10p (+ VAT) per card on your behalf to a registered charity of your choice, at no extra cost to you. 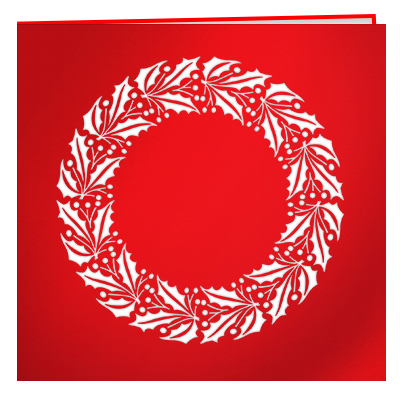 Click here to browse our whole selection of Christmas Cards.